This list is in no way comprehensive and is listed in no particular order. Suggestions are welcome. If you like paperweights - BUY THIS BOOK! Filled with beautifully detailed photographs of Paul Stankard's paperweights as well as excellent closeups of the making of his flowers and other paperweight inclusions. It also includes an interesting background on Paul's career and philosophy, but the multitude of wonderful color photographs of his extraordinary work are what make this book truly special. Although not intended to be, I consider this somewhat of a companion book to the one above. Virtually everyone with more than a passing interest in glass art and paperweights knows of Paul Stankard's work, but very few know the full story of how he got to where he is today. This is that story, as told by Paul himself. A very interesting background on Paul Stankard's career and evolution from production scientific glassblower to world famous glass artist, as well as the challenges he faced along the way. Well worth reading. No, it's not about glass, but this one is my hidden treasure. I picked this up at a library sale for 25 cents. (I LOVE library sales!) I had never heard of it and bought it on a whim, without really looking at it (why not, it was just a quarter). I have been thankful ever since. Explains things in such a clear and understandable way, that even those of us who are "ceramically challenged" get it. It is a WONDERFUL book! Published in 1949, there is a wealth of practical information on working with clay, making molds, slipcasting, glazes, clays, etc. From the days when "do it youself" really MEANT doing it yourself. I expect to use the information to make some glass melting crucibles, some slumping molds, and a few other things. I thought it was no longer available, but it turns out it was reprinted in 1985. I guess I'm not the only one who thinks it is a good book. If you make glass out of the furnace or want to know how it's done, I can sum up my opinion in three words - BUY THIS BOOK! Excellent book covering a multitude of glassworking techniques (for the furnace). Handwritten and illustrated, this is easily the best book of its kind available (and would still be, even if there WERE any others of its kind available). It is like having great notes from 12 years worth of glassmaking classes in one binding. The only complaints I have are that the table of contents is not very complete (although the index is, which almost makes up for it) and that I find the handwritten text a little difficult to read at times (my eyes aren't what they used to be). These are very minor gripes in the scheme of things. Formerly known as Ed's Big Handbook of Glassblowing, this fully revised and completely illustrated book covers all aspects on how to blow hot glass from the furnace. Teaches about the tools, techniques and concepts involved in furnace glassblowing. An excellent "how-to" book. Handwritten text. Still, in spite of these minor annoyances, I would definitely recommend this book to anyone wanting a text on building glass studio equipment. Comprehensive book about lampworking. Good book for those looking for information on lampworking techniques and suppliers, as well as info on setting up a lampworking studio. Best book of its kind that I know of. Apparently there is a new edition that just came out with even more info in it. Describes a variety of lampworking techniques in an understandable way. Step by step instructions on making a variety of small glass animals and other items. Good instructional book. This is a good book for someone who wants to learn to make critters 'n stuff with a torch. A new book about, well, firing schedules for glass. Firing Schedules for Glass is divided into 3 parts. The first contains the fundamentals of glass firing, essential knowledge for effective use of the firing schedules in part 2. The second part consists of a multitude of detailed firing schedules and charts for a wide variety of types and thicknesses of glass. The final part of the book features some very useful technical data, conversion tables, blank firing charts and log sheets, and other information to help enhance the the reader's understanding of the process and the materials. 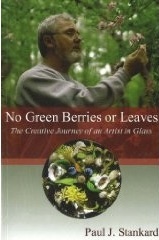 This is an excellent book that will make life far easier for a wide range of glass artists. The firing shedules in the book would take years to determine on one's own. Spiral bound, on normal printer paper, the somewhat homemade look of the book in no way detracts from the excellent infomation within. A very good new book about slumping and fusing glass (AKA, "warm glass"). The book contains various slumping/fusing projects, information aimed at both beginning level fusers/slumpers as well as the more experienced, and lots of color photos. I sent a copy to a friend of mine who does fused glass and she loved it. She even used it during a class she was teaching the day after she received it, and her students thought it was great too. I spoke to her about it again recently and she said the more she uses this book, the more she loves it. The author, Brad Walker, also has an excellent website about warm glass (oddly enough, called warmglass.com). You can order the book direct from his website. You can also order Firing Schedules for Glass (above) from there, too. This is a unique and excellent book for flameworkers, especially those working with borosilicate. Unlike Contemporary Lampworking, another excellent lampworking book focusing on a different audience, it does not try to be all things to all people. Advanced Flameworking / Making and Marketing is printed in an unusual "double" book format, being essentially two related books combined into one binding. Reading from the front cover, one finds Advanced Lampworking, which has a wealth of EXTREMELY detailed information about subjects ranging from tools and techniques to problem solving in the studio. The hundreds of step-by-step full-color photographs and explanations of various pieces being made are the most detailed I have ever seen published anywhere, and the color charts showing the various effects achieved with different colors and heat treatments of Northstar borosilicate color rods (including exactly which Northstar colors are used for each) are of immense value to anyone using borosilicate. Beginning from what would normally be the "back" cover, Making and Marketing Better Work is an otherwise completely separate volume containing Milon's advice on dealing with the practical aspects of making and selling one's work. With nearly 30 years of experience in the field of producing and marketing his glasswork, and having attained worldwide recognition as a glass artist, he is as qualified as anyone (and far more qualified than all but a very few) to offer this advice. This volume covers everything from dealing with shops/galleries to laying out what is essentially a roadmap to successfully realizing ones personal goals. Presented in a straightforward manner, the information provided is insightful, and very practical. Advanced Flameworking is also available without the Making and Marketing Better Work addition. In spite of the additional cost, I would strongly recommend the double book to anyone who wants to sell his/her glass. I have always loved Milon's work. I love his book as well! More of a booklet than an actual book, in reality this is a 90 page compilation of notes, handouts, and information from the glass lectures given by Frank Woolley at the Studio of the Corning Museum of Glass over the course of several years. "Real" book or not, it is very much worth having for anyone melting, thinking about melting, or simply working with, glass. It contains a great deal of very practical information presented in a very understandable way. It is well worth the $15 price. This text is especially useful to someone wanting to make his/her own glass and understand some of the technical aspects involved. It also contains the best explanation of glass compatibility I have seen anywhere. While not widely available, it should be available from either http://whitehouse-books.com or the bookstore at the Corning Museum of Glass. Price as of 6/27/05 is $15, and is money well spent. Speaking of glassmaking bibles - if you plan to make your own colored glass, this book is a "must have". It may be a little difficult to find, but Whitehouse-books.com in Corning, NY had several new copies of this classic glass text on the shelves the last time I was there. Apparently it was recently reprinted. Written for potters who want to build their own kilns, there is a lot of information that is also applicable to building glass furnaces and annealers. This is an excellent supplemental book for someone wanting to build his/her own equipment. Since a glass annealer is so similar to a ceramic kiln, much of the info in this book is applicable to either. Some very useful charts and tables concerning gas piping sizes and BTU outputs, as well as many other things. The more gas-fired equipment you use (or want to build), the better this book is. Also has info on electric heating elements and wire sizes and types. "Completely revised and enlarged" by Cameron Harman in 1973 this one has a bunch o' technical information on (what else?) ceramic glazes. This is probably the glaze bible for potters. Another good addition to the technical glass library, even if it was written for potters. After all, glaze is just glass that you coat clay with, isn't it? What's that you say? You'd like to make a high vacuum system or a fractional distillation column. This book will show you how it's done. Aimed primarily at laboratory glassblowers, Scientific Glassblowing has a lot of information that would be useful to the inquisitive lampworker. For instance, there is a chapter with info on vacuum coating glass surfaces (think "dichroic"). My favorite glassblowing newsletter for furnace workers. Contains information about glass chemistry, color formulation, equipment building, etcetera, as they pertain to the small scale glass studio. A valuable resource, TIG started out as a bi-monthly newsletter and went to quarterly publication in the early 1990's. Unfortunately, it ceased publication several years ago. Fortunately, a compendium of many of the back issues is now available electronically as a .pdf by using the email link above. It is well worth the price of $39.95. As someone said to me back in the 1980's when I was considering whether or not to subscribe to the newsletter, "If you learn one thing a year that saves you two hours of work, you have more than paid for your subscription". Since then, I have saved much more time and energy than that. A good bi-monthly newsletter primarily aimed at lampworkers. There is also an online version with an excellent links page to all kinds of glass related pages and various glass discussion boards. Crafts Report - Magazine for those trying to make a living in the art and/or craft biz. Some very good articles and useful information. Sunshine Artist - Another magazine specifically for those trying to make a living in the art and/or craft biz, the reviews they publish about craft shows around the country being their primary claim to fame. The quality of the content varies. Most of their website is unavailable to non-subscribers to the magazine, but there is still enough info to make it worth checking out. You can also check with amazon.com for books in which you are interested. I have found a few of the books listed above discounted up to 30% through them. Because I receive a (very) small percentage of Amazon sales made via this, and the other links above, shopping through them will help support and improve this website without costing you anything extra. This is Brian Kerkvliet, a well known beadmaker who had a copy of my books and periodicals page embedded in one of his web pages as though he was the author of it. When I discovered it and complained, he told me I should be flattered that he liked it enough to steal it and post it on his website. Normally, I hate animated GIFs, but I am quite fond of this one. *Disclaimer: In order to keep things honest and above board, I want to let you know that now, if you use the search engine or one of my links to click through to Amazon.com, and buy the book while you are there, I will receive a (very) small percentage of the selling price. Which means that, unlike when I recommended them before, now they do give me something. But, I found out about this program more than a year after writing the recommendation above, so any compensation I may receive now had nothing to do with that original recommendation. I was buying books from Amazon.com long before now and I will continue buying from them in the future, compensation or none. The flip side of this is that if you like my website and you are going to buy a book (or video, CD, or tape) from Amazon.com anyway, you can help support the time and effort that I spend on this website by clicking through to them from here. But if they don't have it in stock and someplace else does, by all means, buy it from the place that has it. Thanks.